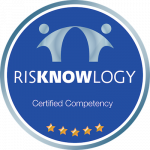 Risknowlogy offers the accredited Functional Safety and SIL for Safety Systems training course for specialists, professionals and engineers. The course focuses on functional safety aspects for any industry dealing with safety systems according to IEC 61508 and or IEC 61511. The main objective of this course is to give engineers, professionals and specialists involved in safety systems the opportunity to learn the fundamentals of functional safety and the requirements of the functional safety safety standards IEC 615108 and IEC 61511. A second objective is to give anybody attending the course the opportunity to certify their knowledge through an exam. Who should attend Functional Safety and SIL for Safety Systems training? Any professionals working directly or indirectly in their workplace with Functional safety and SIL for Safety Systems.